News of War: Civilian Poetry 1936-1945 is a powerful account of how civilian poets confront the urgent problem of writing about war. The six poets Rachel Galvin discusses-W. H. Auden, Marianne Moore, Raymond Queneau, Gertrude Stein, Wallace Stevens, and César Vallejo-all wrote memorably about war, but still they felt they did not have authority to write about what they had not experienced firsthand. Consequently, these writers developed a wartime poetics engaging with both classical rhetoric and the daily news in texts that encourage readers to take critical distance from war culture. 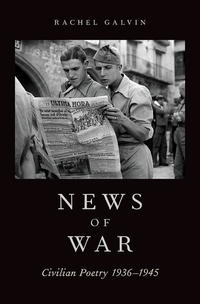 News of War is the first book to address the complex relationship between poetry and journalism. 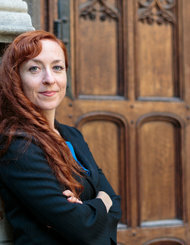 In two chapters on civilian literatures of the Spanish Civil War, five chapters on World War II, and an epilogue on contemporary poetry about the wars in Iraq and Afghanistan, Galvin combines analysis of poetic form with attention to socio-historical context, drawing on rare archival sources and furnishing new translations. In comparing how poets wrestled with the limits of bodily experience, and with the ethical, political, and aesthetic problems they faced, Galvin theorizes the concept of meta-rhetoric, a type of ethical self-interference. She argues that civilian writers employed strategies drawn from journalism precisely to question the objectivity and facticity of war reporting. Civilian poetics of the 1930s and 1940s was born from writers' desire to acknowledge their own socio-historical position and to write poems that responded ethically to the gravest events of their day.